Within the box you get a booklet of instructions and five bags. Curiously, my set included an extra bag of duplicate parts. I’ll get to why this happened later in the review. The set includes a Concussion Rifle, SAW and Hydra. 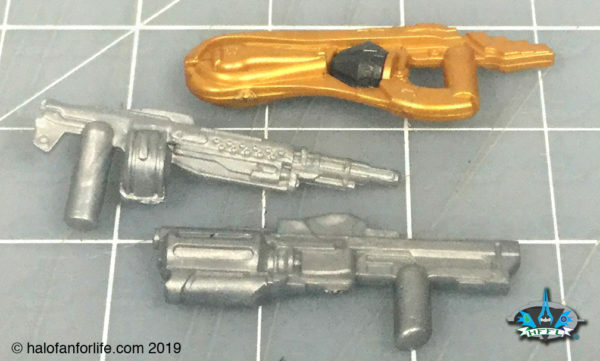 I’ve mentioned this before when sets include the concussion rifle, but, be extra careful with that tiny black conical piece. I can be easy to lose. It does snap into place easily though and should stay put once there. The pieces are all sorted out. 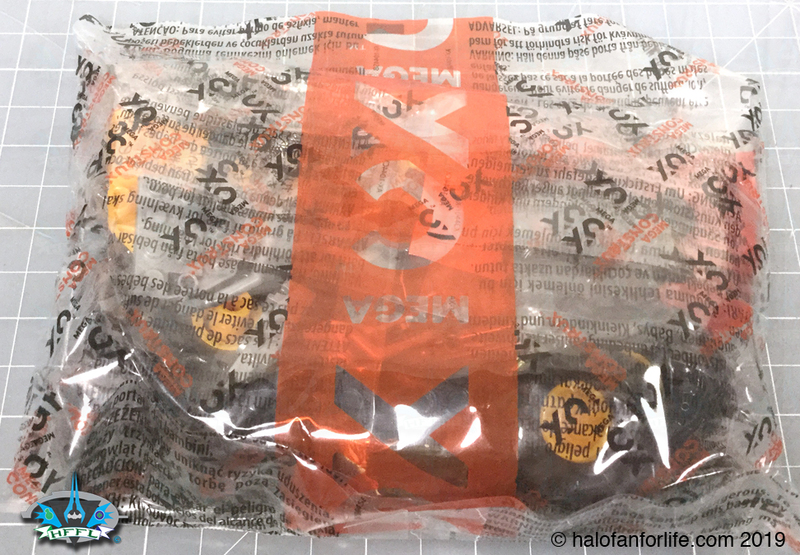 This set includes mostly dark grey, yellow and black parts. 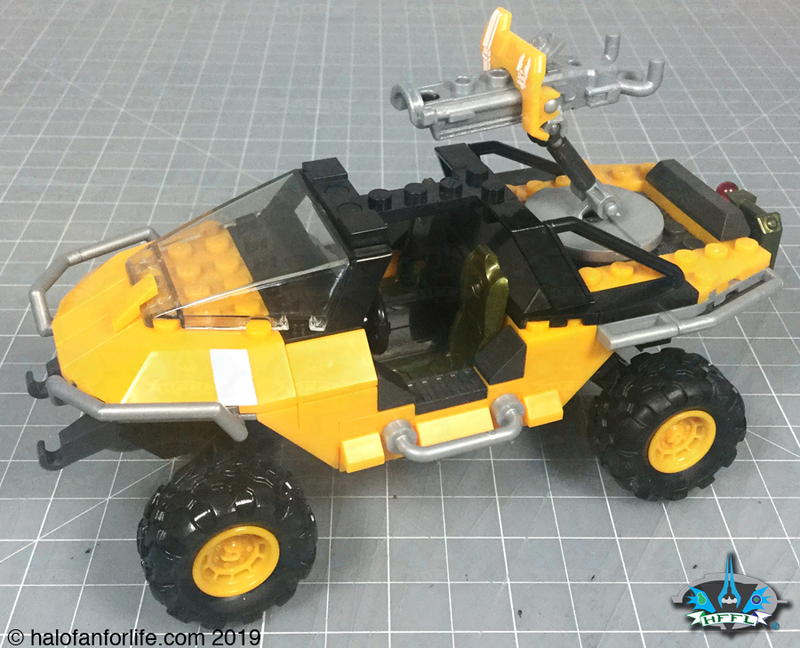 The build of the Warthog is fairly standard, though I think there were a couple different steps with this one. Note that the set includes red bloks that you prop up the body of the hog while you build. This allows for stability. 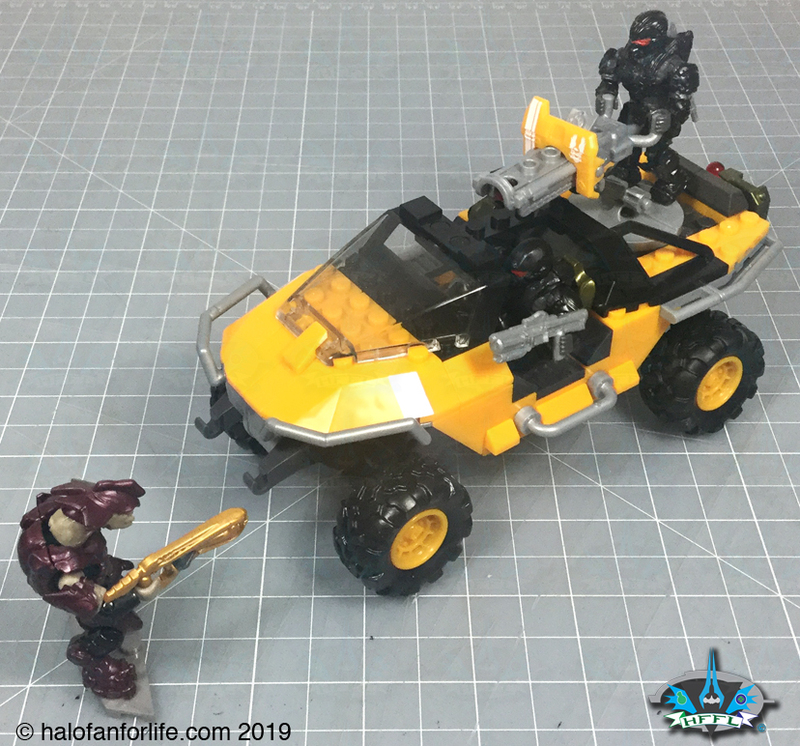 Of note at the bottom right of the above pic, if you stop there and just add the tires and NOT the turret, you essentially have the passenger gold Warthog that was in Halo 2. It’s a nice little bonus, even if unintended. 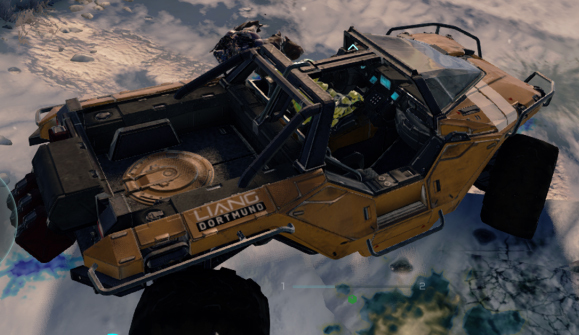 The Warthog is complete. I REALLY like this color scheme! Elite Commander: I really like the wine color of the armor. It speaks of some regal nature to me. Of course the armor looks fantastic. 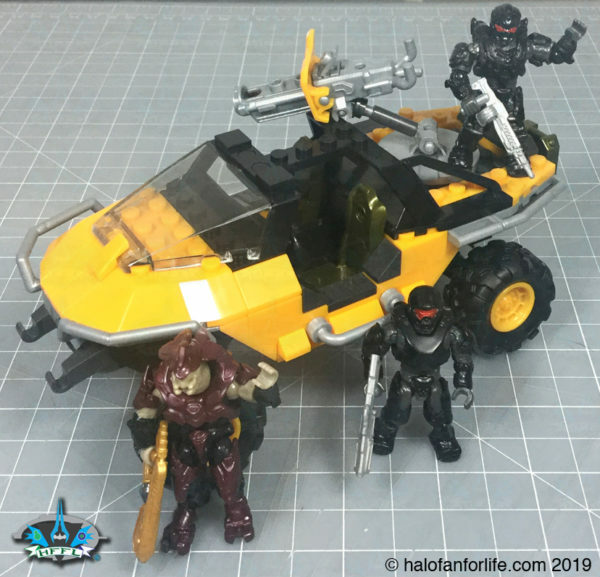 Spartan Athlon: I’m a HUGE fan of the Athlon armor and am always happy to see it make it’s way into sets. That this is all black armor with a red visor is all the better. I seems “deadly”. Protector Spartan: Protector is another set of armor that I really like. With it’s black armor and red visor as well, it makes for a great partner to the Athlon in this set. 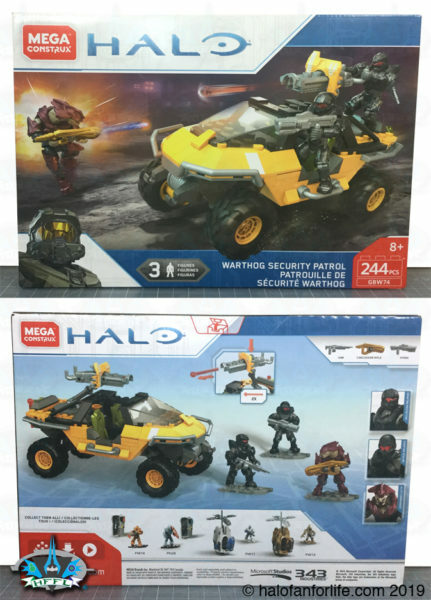 Here is the full Warthog Security Patrol set with figures in place. Are the Spartans going to mow down that Elite? Or will the Elite blast the warthog out of the way? Here are the pieces left over after the build. I expected the 4 red bloks. Curiously, I had some rather unique parts as extras. The Elite and Spartans patch things up and wave a hello to you! Now, about that extra bag of parts. It includes duplicates of all the parts of the same other bag. The one big difference though is that it had an Athlon Spartan and for some wild crazy reason a Call of Duty figure. So the extra bag was to cover for that fact so that you got the Spartan Protector as advertised on the box. I’m actually kind of happy with this figure. I hay use him as some grounds crew for incoming Pelicans and such. I’ll definitely make use of the parts that also came in that bag. So a nice little bonus for we consumers, even if it was a bit of a mistake by Mega. Summary: The set is quick build and can easily be completed from start to finish, in one hour. The color scheme looks great and matches that of the Liang Dortmund Security Warthog. Figure choices are excellent and also have good color schemes to them. Overall Rating: I give this set 9.0 out for 10 medals. Why did I give it a 9.0 out of 10? 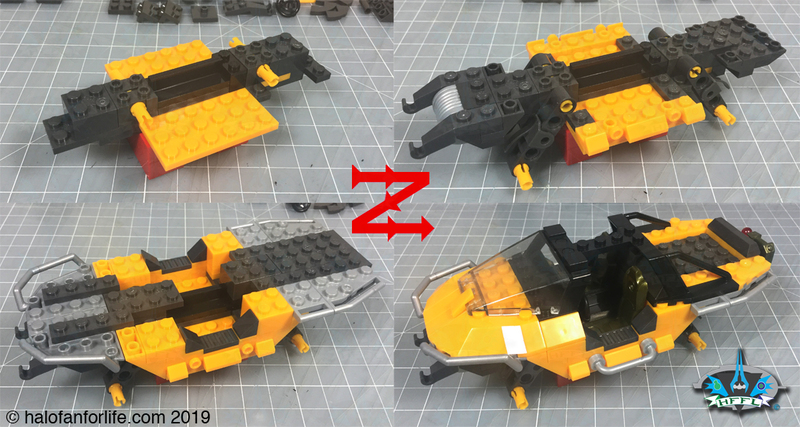 • One slight reason I didn’t give the set a 10 is it’s missing the Liang Dortmund logo near the back of the Warthog. I do understand though that Mega perhaps did not want to hamper the set’s identity with one corporation in Halo and wanted it to be generic. • The only other slight reason is that this set should also include 3 gas cans like all the other Warthogs of recent release before it. See pics below for in-game examples. • Lastly is the price to part ratio and the final price. 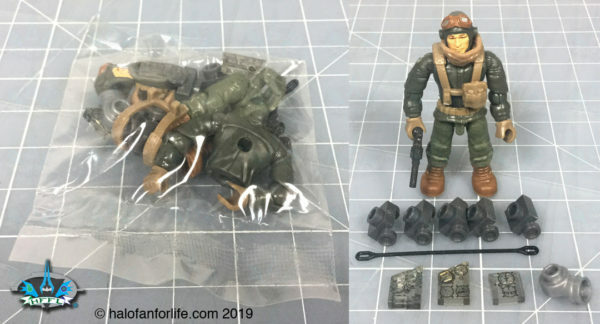 At 244 pieces, I expected this set to cost no more than $25. For that it gets a half point off. • This leaves $19.50 left for the Warthog. I do not quite think that value is there with this one for two reasons. 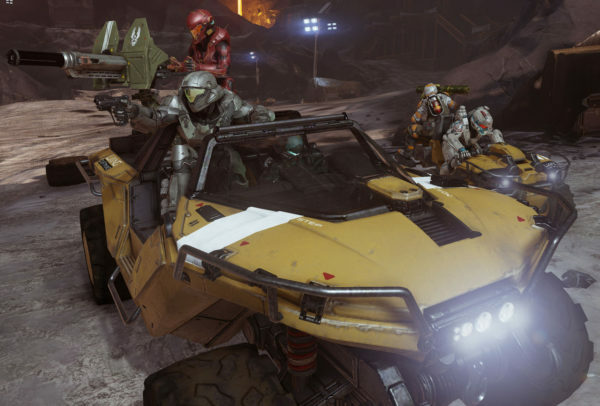 The missing two gas cans and the quirky action feature machine gun, instead of the more realistic in-game styled machine gun the Warthogs used to have. I place value of the Warthog itself at $17.50. Given that the set costs $30 US before tax, this set’s value is close to what it should be. 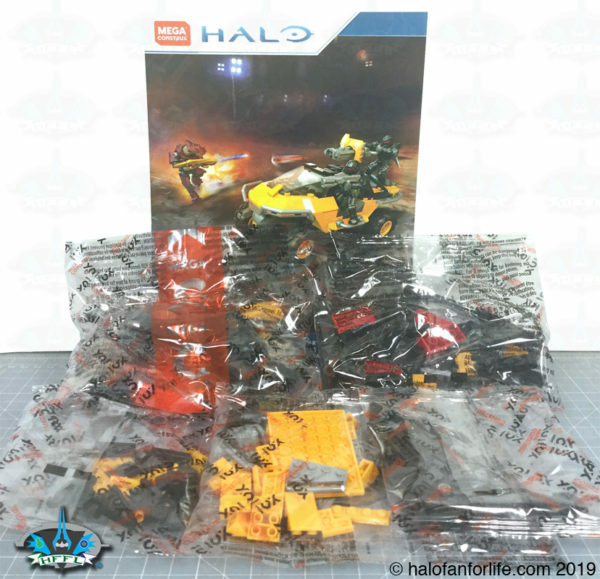 Since the set only has 244 pieces though, the price should have been $25 instead. At that lower price, the set would have had a much better value. A note on the above paragraph. I have to chalk the higher price up to Mattel. 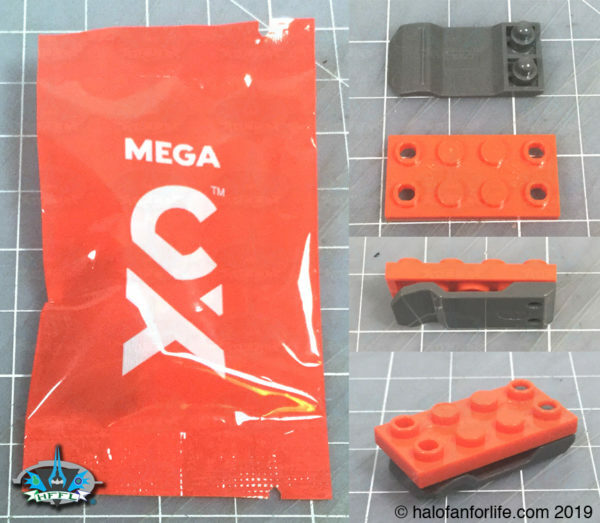 Mega Bloks before being bought by Mattel were great at price per piece ratio when concluding with a final retail price. Mattel really needs to consider bringing prices down slightly for their sets. They are already shunning many kids, collectors and fans alike with not having much product on store shelves. Making the sets more expensive isn’t going to help them any. Perhaps the higher prices are in response to Toys R Us closing and that shelf space is now even more of a premium at stores like Wal Mart and Target. Never the less, to take that out on consumers is a path that is sure to kill a line, rather than revive it. Do I recommend it? YES! The color scheme is great. I like the figure choices, specifically the Black clad Spartans. A great addition to your Warthog fleet!